Situated within the Hart District Conservation area fronting the desirable Hunts Common is Fallow View, this four/five-bedroom, light and spacious detached family home with large rear garden (approx 200ft) has been greatly improved and well maintained by the current owners. A shingled driveway providing parking for several vehicles and gives access to the detached double garage and the garden. 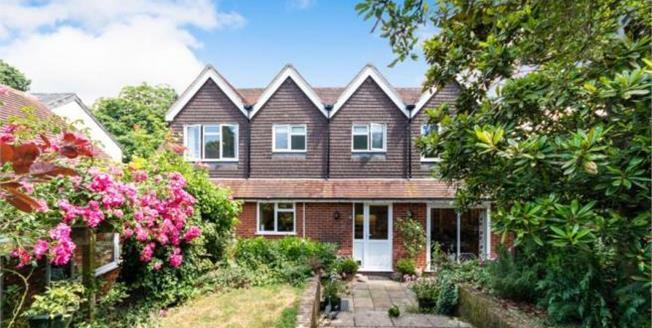 The property is situated in the delightful village of Hartley Wintney and is within easy walking distance of local schools and the village centre with a good range of shops for day to day needs as well as a number of restaurants and public houses. Hartley Wintney is a well-known and picturesque village with its own golf course, football club and historic cricket club and is an ideal location for walkers with its numerous footpaths and bridleways for horse riders with access to heathland and the Bramshill forestry commission enclosure. kitchen/breakfast room (currently fitted with an AGA), study with fitted bookcases and cupboards, family room/snug/bedroom five, shower room with w.c. and utility/boot room. First floor: spacious master bedroom with fitted wardrobes, en-suite and large eaves storage, two double bedrooms one with a fitted cupboard/wardrobe, single fourth bedroom and family shower bathroom. There is a boarded loft running the whole length of the house which is accessed from the master bedroom. Outside there is a paved patio area providing access to the garage and front of the property, the generous garden is mainly laid to lawn with fruit and mature trees and shrubs providing shading, seclude sitting areas.